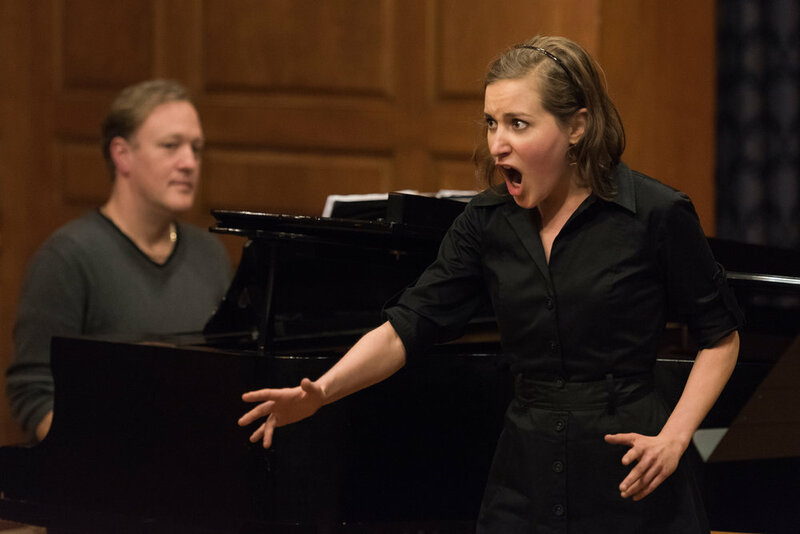 AOP’s Composers & the Voice, a tuition-free training program, is a competitive two-year fellowship offered to composers and librettists. Created in 2002 by conductor and C&V Artistic director Steven Osgood, composers & the voice has become a one-of-a-kind, industry-recognized program that teaches emerging creators how to write for the voice and develop new operas and music-theatre through intense workshops with professional artists. 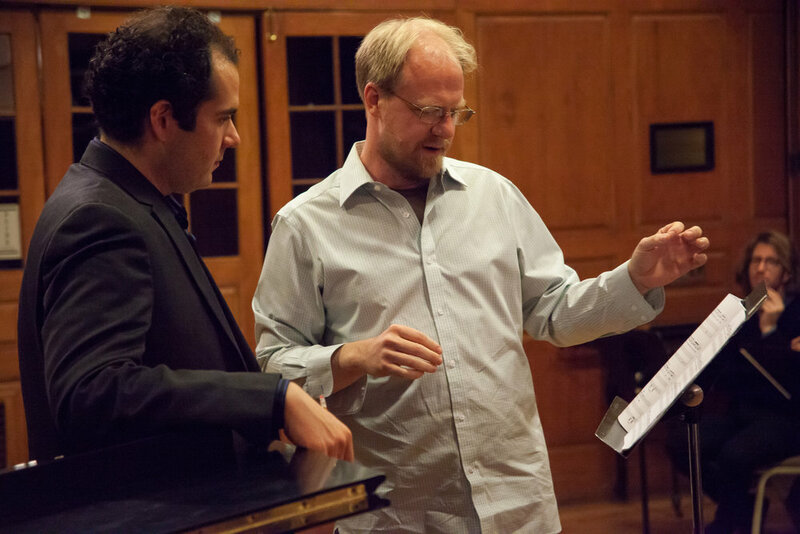 since its creation, C&V has fostered the careers of over 70 composers and librettists. In the first year of the fellowship, the Composers & the Voice series has two major components: Music Workshop Sessions with singers and music directors and Skill Building Workshop Sessions with members of the Artistic Team at AOP’s home in Brooklyn, NY. The Artistic Team includes Steven Osgood, Composers & the Voice founder and Artistic Director, a Head of Music, a Head of Drama, an additional Music Director, and instructors in libretto writing, acting, and improvisation, as well as guest artists. During the year each fellow is paired with a C&V Artistic Chair, professional composers and librettists that make themselves available for one-on-one discussions and feedback. In the second year of the fellowship, AOP provides continued mentoring and career guidance on a one-on-one basis. AOP’s General Director and Artistic Director schedule networking events and meetings, guest classes with industry professionals, and individual consultations on projects-in-development. Select C&V operas-in-progress have opportunities for continued development workshops with AOP and our presenting partners. Fellows learn to write for the operatic voice through detailed group feedback sessions of their work with the American Opera Projects' Resident Ensemble of six professional singers who have been selected based on their superior technical and musical skills, as well as their commitment to developing and performing new works. The ensemble is comprised of one each of the basic operatic/vocal categories: Coloratura Soprano, Lyric Soprano, Mezzo-Soprano, Tenor, Baritone and Bass. The composers and librettists work with each singer, one at a time, in rotation, learning how their particular voice works throughout its range, addressing issues of tessitura, negotiating the passagio, demands for vowel modification, and how these affect their performance of text. 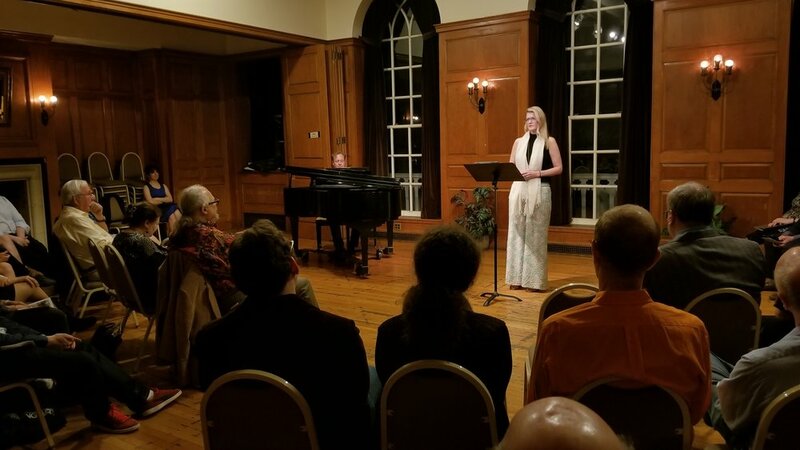 The participants write solo works with piano accompaniment for each singer which are performed and discussed by the entire group on how well suited the composition is to the voice, and the clarity of its text setting. Surrounding and enhancing the Music Workshops Sessions, the C&V Skill Building Sessions explore new and traditional techniques in writing for the stage and occur approximately every 2 weeks throughout the season. Fellows will analyze both traditional and contemporary scores and libretti while discussing and experimenting with word choice, rhyme, meter, story structure, character archetypes, and more. Throughout the year, composers and librettists work on creating the outline and synopsis for a complete opera with a focus on completing specific scenes to be composed and presented to the public in a semi-staged format at the end of the workshop session. 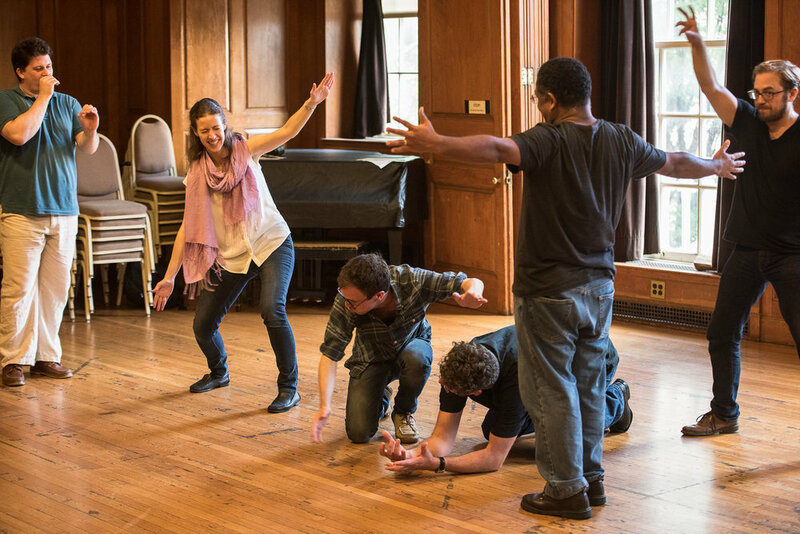 A unique aspect of the C&V workshop season are our classes on Improv and Acting for opera writers, physical sessions that explore new approaches to their creativity. In our Improv Sessions, our fellows get on their feet (and the floor and on chairs) to discover the mind-opening world of improvisational thinking. With so many forms and structures, how can artists think outside the box? How can we tap into individual creativity in a highly collaborative art form? How can a group think as one creative entity in pursuit of telling a story? Our Improv studies are a fun, exciting, and boundary-breaking journey into our creative potential. In our Acting sessions, our composers and librettists approach opera through the mind of the performer creating a character. By learning to ask the subjective questions of characters, we discover the roots of why we tell and listen to stories. What do I want? Why do I want it? How will I get it? Fellows learn to analyze text from the inside out, explore various acting techniques, and discover what the world looks like from the point of view of the stage. C&V workshop sessions are closed to the public to maintain an environment of honesty and experimentation. 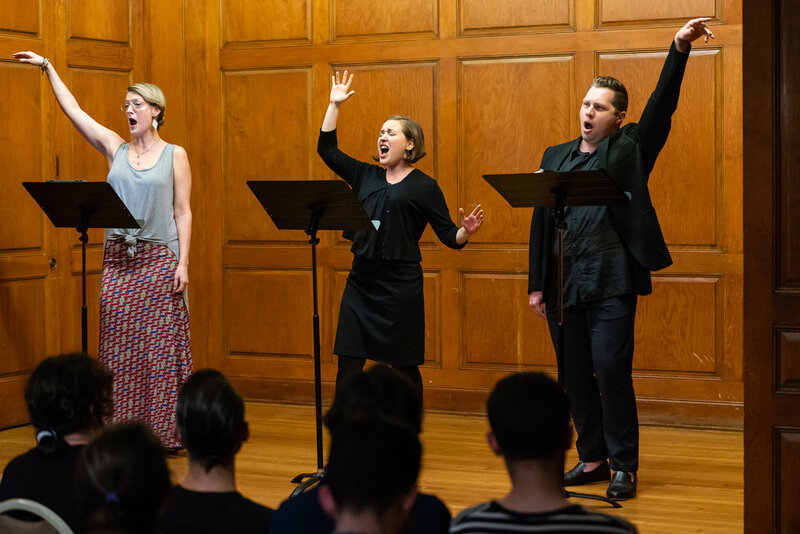 At the end of the workshop sessions, the public is welcomed to two concerts of work created during the series performed by the C&V Resident Ensemble of Singers. The first performance, First Glimpse, is a spring concert of selected solo works written during the course of the workshops for each singer’s specific voice. In the fall of the second year, Six Scenes features semi-staged scenes from operas-in-development also written during the course of the workshops.